"Stuga" redirects here. For the video game, see The Cottage (video game). For other uses, see Cottage (disambiguation). A cottage is, typically, a small house. It may carry the connotation of being an old or old-fashioned building. In modern usage, a cottage is usually a modest, often cosy dwelling, typically in a rural or semi-rural location. The word comes from the architecture of England, where it originally referred to a house with ground floor living space and an upper floor of one or more bedrooms fitting under the eaves. In British English the term now denotes a small dwelling of traditional build, although it can also be applied to modern construction designed to resemble traditional houses ("mock cottages"). Cottages may be detached houses, or terraced, such as those built to house workers in mining villages. The tied accommodation provided to farm workers was usually a cottage, see cottage garden. Peasant farmers were once known as cotters. 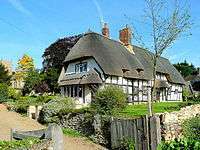 The holiday cottage exists in many cultures under different names. In American English, "cottage" is one term for such holiday homes, although they may also be called a "cabin", "chalet", or even "camp". In certain countries (e.g. Scandinavia, Baltics, and Russia) the term "cottage" has local synonyms: In Finnish mökki; in Estonian suvila; in Swedish stuga; in Norwegian hytte (from the German word Hütte); in Dutch keuterij; in Slovak chalupa; in Russian дача (dacha; which can refer to a vacation/summer home, often located near a body of water). In places such as Canada, "cottage" carries no connotations of size (compare with vicarage or hermitage). 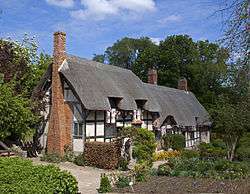 Originally in the Middle Ages, cottages housed agricultural workers and their friends and families. The term cottage denoted the dwelling of a cotter. Thus, cottages were smaller peasant units (larger peasant units being called messuages). In that early period, a documentary reference to a cottage would most often mean, not a small stand-alone dwelling as today, but a complete farmhouse and yard (albeit a small one). Thus, in the Middle Ages, the word cottage (MLat cotagium) denoted not just a dwelling, but included at least a dwelling (domus) and a barn (grangia), as well as, usually, a fenced yard or piece of land enclosed by a gate (portum). The word is probably a blend of Old English cot, cote "hut" and Old French cot "hut, cottage", from Old Norse kot "hut" and related to Middle Low German kotten (cottage, hut) . Examples of this may be found in 15th century manor court rolls. 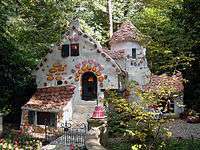 The house of the cottage bore the Latin name: "domum", while the barn of the cottage was termed "grangia". Later on, "cottage" might also have denoted a smallholding comprising houses, outbuildings, and supporting farmland or woods. A cottage, in this sense, would typically include just a few acres of tilled land. Examples of this type included the Welsh Tŷ unnos or "house in a night", built by squatters on a plot of land defined by the throw of an axe from each corner of the property. Much later, from around the 18th century onwards, the development of industry led to the development of weavers' cottages and miners' cottages. 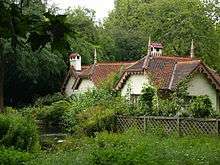 In England and Wales the legal definition of a cottage is a small house or habitation without land. However, originally under an Elizabethan statute, the cottage had to be built with at least 4 acres (0.02 km2; 0.01 sq mi) of land. Traditionally the owner of the cottage and small holding would be known as a cottager. In the Domesday Book they were referred to as Coterelli. In Welsh a cottage is known as bwthyn and its inhabitant preswlydd. In Scotland and parts of Northern England the equivalent to cottager would be the crofter and the term for the building and its land would be croft. Over the years various Acts of Parliament removed the right of the cottager to hold land. According to the Hammonds in their book The Village Labourer, before the Enclosures Act the cottager was a farm labourer with land, and after the Enclosures Act the cottager was a farm labourer without land. 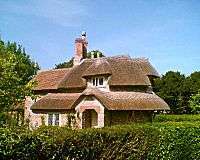 In popular modern culture the term cottage is used in a more general and romantic context and can date from any era but the term is usually applied to pre-modern dwellings. Older, pre-Victorian cottages tend to have restricted height, and often have construction timber exposed, sometimes intruding into the living space. Modern renovations of such dwellings often seek to re-expose timber purlins, rafters, posts etc. which have been covered, in an attempt to establish perceived historical authenticity. Older cottages are typically modest, often semi-detached or terraced, with only four basic rooms ("two up, two down"), although subsequent modifications can create more spacious accommodation. A labourer's or fisherman's one-roomed house, often attached to a larger property, is a particular type of cottage and is called a penty. The term cottage has also been used for a larger house that is practical rather than pretentious: see Chawton Cottage. Irish cottages (Irish: teachín) were historically the homes of farm workers and labourers, but in recent years the term has assumed a romantic connotation especially when referring to cottages with thatched roofs (Irish: teach ceann tuí). These thatched cottages were once to be seen all over Ireland, but most have become dilapidated due to newer and modern developments. However, there has been a recent revival of restoring these old cottages, with people wanting a more traditional home. 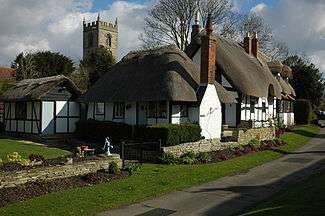 Today, thatched cottages are now mostly built for the tourist industry and many can be rented out as accommodation. Although the Oxford English Dictionary states that the term cottage is used in North America to represent "a summer residence (often on a large and sumptuous scale) at a watering-place or a health or pleasure resort," most Americans expect a cottage, particularly a summer cottage, to be a relatively small, possibly unfinished house. Various editions of the quintessentially American Webster's Dictionary define it as "a small house; any modest country or suburban dwelling," (fifth edition) with the eleventh edition describing even a vacation cottage as "a usu. small house for vacation use." In North America, most buildings known as cottages are used for weekend or summer getaways by city dwellers. 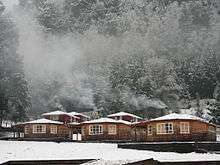 It is also common for the owners of cottages to rent their properties to tourists as a source of revenue. In Saint John, U.S. Virgin Islands, most buildings known as cottages or vacation rentals are used for weekend or summer getaways. In Michigan, when one refers to a cottage it normally means a summer residence farther north near or on a lake. In the jargon of English-speaking Quebec's real-estate industry, a cottage is any two-storey house, as opposed to a bungalow. However, "cottages" in Eastern Canada are generally located next to lakes, rivers, or the ocean in forested areas. They are used as a place to spend holidays with friends and family; common activities including swimming, canoeing, waterskiing, fishing, hiking, and sailing. There are also many well-known summer colonies. Cottage living is one of the most popular tourist draws in Ontario, Canada, parts of which have come to be known as cottage country. This term typically refers to the north and south shores of Georgian Bay, Ontario; Muskoka, Ontario; Haliburton, Ontario; and the Kawartha Lakes, Ontario; but has also been used to describe several other Canadian regions. The practice of renting cottages has become widespread in these regions, especially with rising property taxes for waterfront property. What Eastern Canadians refer to as "cottages" (seasonal-use dwellings), are generally referred to as "cabins" in most of North America. This is most notable in the Midwest and Western United States, and Western Canada. In much of Northern Ontario, New England, and upstate New York, a summer house near a body of water is known as a camp. In the 1960s and 1970s, the A-Frame house became a popular cottage style in North America. 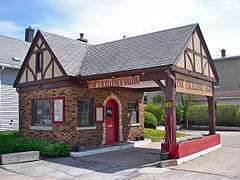 In the 1920s and 30s many gas stations were built in the style of Old World cottages. Comprising about a third of the stations built in the United States in those years, cottage-patterned facilities evoked a picturesque homeyness and were easier to gain approval for than the more stylized or attention-grabbing designs also commonly used at the dawn of the automobile era. Statistics Finland defines a cottage (Finnish: mökki, Finland Swedish: stuga or villa) as "a residential building that is used as a holiday or free-time dwelling and is permanently constructed or erected on its site". Finnish cottages are traditionally built of logs but other wood constructions have become common. They are usually situated close to water and almost all have a sauna. 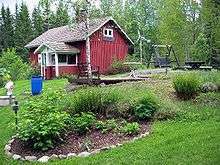 There are 474,277 cottages in Finland (2005), a country with 187,888 lakes and 179,584 islands, including rental holiday cottages owned by hospitality companies but excluding holiday villages and buildings on garden allotments. Reports have 4,172 new cottages built in 2005. Most cottages are situated in the municipalities of Kuusamo (6,196 cottages on January 1, 2006), Kuopio (5,194), Ekenäs (Tammisaari – 5,053), Mikkeli (4,649), and Mäntyharju (4,630). Swedish cottage in Ljusterö, Stockholm. The formal Swedish term for cottages is fritidshus (vacation house) or stuga, of which there are 680.000 in Sweden (2007). According to Statistics Sweden, about 50% of the Swedish population has access to a vacation house. In everyday talk, Swedes refer to their cottages as lantstället (the country house) or stugan (the cottage). Most vacation houses in Sweden are to be found along the coasts and around the major cities. Prices vary a lot depending on location; a modern seaside house near Stockholm may cost 100 times as much as a simple cottage in the inner regions of northern Sweden. Until the end of World War II, only a small wealthy Swedish elite could afford vacation houses—often both a large seaside house and a hunting cabin up north. During the rapid urbanisation in the 1950s and 1960s, many families were able to retain their old farmhouses, village cottages and fisherman cabins and convert them into vacation houses. In addition, economic growth made it possible even for low income-families to buy small lots in the countryside where they could erect simple houses. Former vacation houses near the large cities have gradually been converted into permanent homes as a result of urban sprawl. The traditional Swedish cottage is a simple panelled house made by wood and painted in red. They may contain 1–3 small bedrooms and also a small bathroom. In the combined kitchen and living room (storstuga) there is usually a fireplace. Today, many cottages have been extended with "outdoor rooms" (semi-heated external rooms with glass walls and a thin roof) and large wood terraces. As a result of the friggebod reform in 1979, many cottage owners have built additional guesthouses on their lots. The formal Norwegian term for cottages is hytte or fritidsbolig (vacation house). Otherwise it is much like the Swedish cottage. A typical Soviet dacha (summer house) in Resheti. Example of what now is called "a cottage" in Russia (Mikhaylovka, Volgograd Oblast). The first known "cottages" were built in Russia in the 19th century, when British culture was popular. 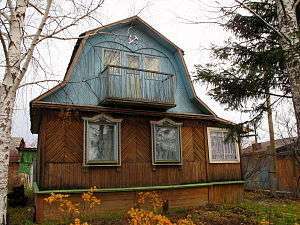 Since the 1980s in former soviet countries the word "cottage" (Russian: коттедж, Ukrainian: котедж) is understood to mean the same as a 'nice house' in western countries, and is associated with the pleasant life of western middle-class people, and thus also the 'good life' in Russia and the CIS. The main reason why a house (Russian: дом [dom], Ukrainian: дім [dim]) is called a "cottage" is an association with new modern good quality living, and not with the degrading remains of Soviet living. 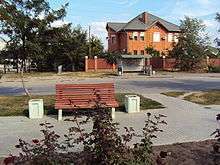 Since the 1990s many "cottage complexes" (or "cottage villages", "cottage towns") have been built, either freestanding or around big cities. They include associated infrastructure and are built as whole projects. There are economy, business and premium (elite) "cottage complexes". New "cottage" settlements are different from old dacha areas, traditional villages, and "private sectors", which are old settlements within a city and consist of 1+ storey houses with small land plots, existing from the soviet era. Cottages are commonly found in the New Territories region of Hong Kong. City dwellers flock to these cottages during holidays and summer months to get away from the hustle and bustle of Hong Kong. Most are three storey brick structures with balconies on the upper floors. There is often an open roofed area for eating and entertaining. These dwellings have full rooms and kitchens. Much like in the rest of the world cottages in South Africa housed agricultural workers and their friends and families. A number of cottages were also constructed for fishermen along the West and South Coasts of the country throughout the 18th and 19th centuries. Most cottages are single story two to four roomed structures sometimes with an attic for storing supplies. 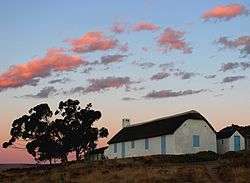 Most cottages in the Western Cape area of South Africa have thatched roofs and stone or adobe walls which were traditionally whitewashed. 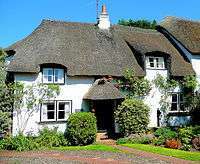 A large number of the remaining cottages in the country are listed heritage sites. ↑ De Vree, Joost. "Keuterij". joostdevree.nl. Retrieved 9 November 2014. ↑ as in domum dicti cotagii "the house of the said cottage"
1 2 3 Elmes, James (1827). On Architectural Jurisprudence; in which the Constitutions, Canons, Laws and Customs etc. London: W.Benning. pp. 178–179. Retrieved 5 December 2013. ↑ Collyer, Adam (1953). The Crofting Problem. Cambridge: Cambridge University. p. 25. ↑ Hammond, J L; Barbara Hammond (1912). The Village Labourer 1760-1832. London: Longman Green & Co. p. 100. ↑ Granger, Susan (June 1985). "National Register of Historic Places Inventory—Nomination Form: Lundring Service Station" (PDF). National Park Service. Retrieved 2015-06-16. Sayer, Karen. Country cottages: a cultural history (Manchester University Press, 2000). Papworth, John B. Rural residences : a series of designs for cottages (London, R. Ackermann, 1818). Downing, A. J. Cottage Residences ( New York : J. Wiley & son, 1873). Ditchfield, P. H. Picturesque English cottages and their doorway gardens (J.C. Winston Co., 1905). Holme, Charles. Old English country cottages (Office of "The Studio", London, New York, Paris, 1906). Green, W. C. & Davie, W. G. Old cottages & farm-houses in Surrey (London, B. T. Batsford, 1908). Ditchfield, P. H. & Quinton, A. R. The cottages and the village life of rural England (London, J.M. Dent & sons ltd., 1912). Elder-Duncan, J. H. Country cottages and week-end homes (London, Cassell and co. ltd., 1912). Holme, Charles (Ed). The village homes of England ("The Studio Ltd.", London, New York, Paris, 1912). Kirby, J. H. Modern cottages (self pub. n.d). 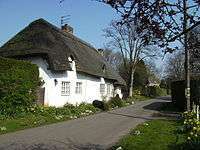 Wikimedia Commons has media related to Cottage.